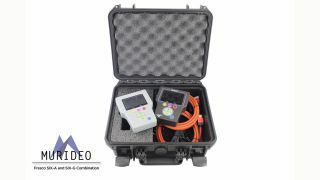 The Murideo SIX-G HDMI Generator and SIX-A HDMI Analyzer are now available for immediate shipping as a set. They are also being entered in CEDIA 2016's competition for Best of Show Awards. The SIX-G and SIX-A were recently featured at the CE Week UHD TV Shootout in NYC and were used to provide reference test patterns (including HDR) and analysis of source devices. The Fresco SIX-G was designed for the AV integration market to confirm HDMI 2.0 and HDCP 2.2 compliance up to the 18 GBP/sec level. Additionally, the SIX-G is an excellent troubleshooting tool for distributed HDMI systems and a reference source for video calibration and is compatible with CalMAN, Light Illusion, and ChromaPure. One of the biggest challenges for integrators today is determining what infrastructure to put in the systems they design and further verifying that all of the components will work together. Over the past few years UHD TVs have been a mix of HDCP 2.2 and 1.4, 300MHz and 600MHz – even to the point of varying by port. HDR also adds some unique challenges like exceeding the 10.2 GBPS HDBaseT threshold - the SIX-G has a full suite of HDR tools to boot. The SIX-G takes the guess work out of troubleshooting and provides absolute information about HDMI components that will work and identifies ones that won’t work – all in a hand-held, portable field tool. "We use the SIX-A and SIX-G for testing basic and complex switching solutions for maximum capability and performance (including complete high bandwidth HDMI cable testing, HDBaseT and HDIP link testing up to 18 GBPS,” said Ricky Jennings of Kalibrate. “We simply love our SIX-A and SIX-G - It's a complete and invaluable tool for our field service teams and has reduced go-backs and replacement on non-defective parts to almost zero." The SIX-A was designed for the AV integration market to troubleshoot, analyze and commission digital AV distribution systems up to HDMI 2.0x and HDCP 2.2 operation up to the 18 GBPS level. Pair the SIX-A with the SIX-G (generator) and you have the perfect "fox and hound" point-to-point troubleshooting system available today. The SIX-A is a cost effective field test tool for systems integrators in today's world of mixed systems and multiple flavors of SD, HD and UHD this tool solves problems.